Our local Porsche Club meets each month at PineScone Café in Pinehurst, NC. It's the normal scene with coffee and scones while we all tell lies about our Porsches and how quick we are. If we were really as fast as we said we were, Roger Penske and Chip Ganassi would be hanging out drinking coffee with us scouting talent! Our PCA Area Director, Marty Barrett is very quick in anything he gets behind the wheel of and spends a tremendous amount of his spare time paying it forward by instructing at events. Marty uses his Yellow GT3 as intended. At Cars & Coffee, Marty’s GT3 was still riding on race rubber from Thursday’s VIR track day and, not for nothing, his golf clubs were riding shotgun; a tee time was next on the schedule! Our area PCA club is very active. Virginia International Raceway is 2-hours north, Carolina Motorsports Park is 90-minutes south, the club is active monthly with social and dinner meetings, and of course we are very involved in the annual Pinehurst Concours d’Elegance as volunteers. Club membership is a nice mix of people who enjoy track events, concours, and restoration projects among other automobile related activities. 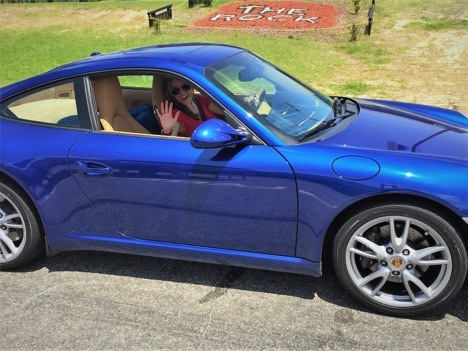 As members purchase newer Porsches we move away from old-school activities and focus more on technology which is great for Porsche and even more beneficial for owners. Launch control was a hot topic this Saturday at C&C and there was much discussion between members centered on good old fashioned horsepower vs. the benefits of launch control. Steve Earwood is a member of our local club and also owns the Rockingham Dragway less than 20-miles from Pinehurst. Steve is a member of the Drag Racing Hall of Fame, a top-notch business owner and supporter of Porsche. Unbeknownst to our club members, Marty Barrett had made previous arrangements with Steve for our members to visit the Rockingham Dragway on Sunday to settle the horsepower vs. launch control argument once and for all. All you had to do was simply tell Marty you were in for drag racing on Sunday! As the group started to gather early Sunday morning for the quick drive down to Rockingham, the mood was decidedly more somber than Saturday morning! I am sure YouTube saw a spike in “Porsche Launch Control” searches the previous evening and some of our guys are now realizing that talking about launch control is much easier than engaging it! We arrived at The Rock on time, signed the waiver form and voila we were now Drag Racers. It was now time to get in line and quickly learn how to read the “Christmas Tree”. One of our members, Keefer Welch, brought his 2009 911 in Aqua Metallic with TUBI exhaust. His Porsche sounded awesome and promised to be quick. Keefer played football for Navy and was a Naval Aviator with much seat-time in the F8 Corsair. The highlight for Keefer today was having his God-Daughter Cameron along for the day. Cameron’s Father flew with Keefer in Vietnam. Cameron was also a US Navy fighter pilot flying the F18 Hornet, do you think these 2 were looking forward to the day?? After the first couple runs we had a feel for the lights and Porsche launch control was the clear winner. Runs in the low 12’s, at 115 mph, started to feel normal for guys that had never been on a drag strip! At this point we started to pair up with Porsches we wanted to match times with. We quickly learned, when we were handed the time-slip at the end of the run, that time-slips don't tell lies like we do. Reaction time was now the hot topic amongst those on the drag strip. A few of our members managed .300 to .500 reaction times. Damn good times. Morning quickly turned to afternoon and we decided to stop for lunch and compare times. The consensus was that Porsche now builds cars that are even more purposeful than ever. Some of our group were at VIR just 3-days prior and now they were having the time of their lives drag racing the same car. Porsche continues to build unbelievably competent automobiles that can be enjoyed in many different ways. Porsche owners really should try the dragstrip at least once! I nearly forgot, it seems Cameron has really taken to drag racing Keefer’s 911. As we were enjoying lunch Cameron drove past us repeatedly, waiving her time slip and heading back to queue up for another run! A great time was had by all. Thanks Chuck! Hope you had a great Memorial Day weekend. I’ve always been surprised that more Porsche owners don’t participate in drag racing so it’s good to see an article about owners enjoying it. Sonoma Raceway (Sears Point to us older folks) has a open drag night on Wednesdays and I used to go to it. I was always the only Porsche there and of course everyone wanted to beat me but my little ’99 Tiptronic Boxster fooled a lot of them as I regularly got into the quarter finals and one evening got into the semi final. I lost to a car by .035 secs and was that close to racing in the final. I used to get puzzling looks and comments about broken drive shafts from my fellow owners and I could never convince them to try it. Launch Control is something I lusted for during my times on the strip. Ronald congrats on your success with your Boxster, time is going to be very kind to the Boxster! You right about launch control, it is a game changer. Our guys had a great time and we are looking forward to returning to the drag strip soon!